Good morning everyone! 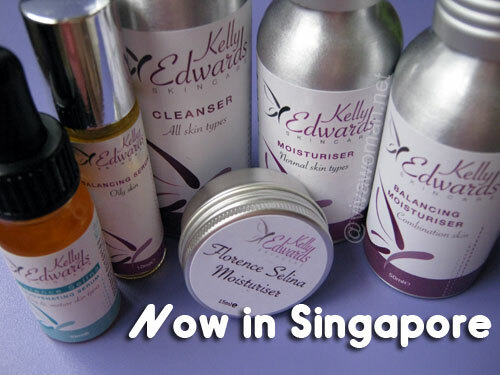 It’s Singapore’s National Day today and we’re celebrating with a giveaway of my new-found favorite brand! 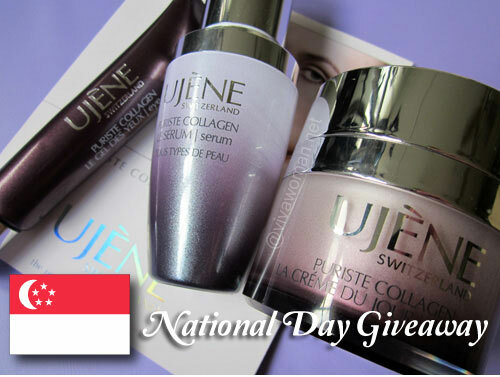 Yes, we’re giving away a set of the Ujene Puriste Collagen range worth over S$300 â€“ an eye gel, a face serum and a day cream. 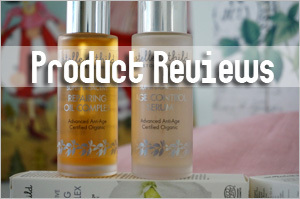 I understand that many of you took the opportunity to snap up the products at 50% off when I last reviewed them so for those who didn’t managed to catch the promotion on time, you won’t want to miss your chance to get the Swiss range for free! 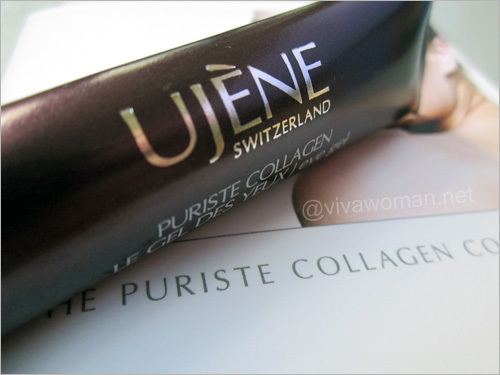 Those who read my review would have remembered reading that the Ujene Puriste Collagen range contains Oviluxe, which is 99% purity collagen that acts as a moisture-magnet in skin, drawing and plumping up vital moisture within skinâ€™s epidermis. The three products that we’re giving away are made with the finest grade ingredients and are free from phthalates, parabens, formaldehydes, propylene glycol, PEGs, volatile alcohols, mineral oil, petrolatum, paraffin wax, synthetic dyes, synthetic fragrance, and essential oils. And if you’re against cruelty and animal testing, then this range is definitely for you. Of the three products, this serum is my favorite. Besides a generous dose of 10% active Oviluxe, this potent serum contains Hyaluronic Acid and Vitamin C, as well as finest grade botanical extracts including Ginseng and Aloe Vera. While I wouldnâ€™t go as far as to say that this product gave me a natural facelift, I actually noticed some my stubborn pigmented marks being lightened up and also some noticeable amount of skin firming after just using this serum for a week. In fact, even the reviewers at MakeupAlley rated this product 5 out of 5. If you’re keen to find out about the Ujene range, check out more details at their website. Tell me something interesting you’ve found about the Ujene range. Be a fan of Ujene Facebook Page. Answer #1 in this entry along with your Facebook name. This giveaway is open to all readers with a local Singapore address. It will close next Friday, 17 August 2012 and the winners will be picked by the team at Ujene and announced on the Viva Woman Facebook Page. So want to get your hands on this interesting range? Then enter right away! I find Ujene range interesting as they contain active ingredients to boost the collagen in the skin, without additives and chemicals and best of all, the creams/gels are odorless and lightweight for easy absorption into our skin. 1 thing I find Ujene range interesting is that it contains 99% purity triple-helix collagen. It’s really rare to find such high content collagen in the market. this range is intersting as it is free from phthalates, parabens, formaldehydes and other harmful ingredeitns and filled with interesting new (at least to me) and potent ingredient like high purity collagen that is biocompatible. I like that the range is formulated with other goodies like hyaluronic acid, Vitamin C, Vitamin E etc. 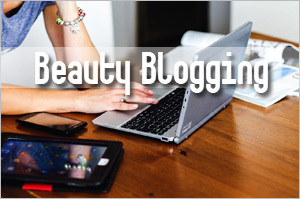 This could be the holy grail for my skin! I find Ujene very unique compare to other skincare which contain collagen because it uses Oviluxe. Conventional collagen is too big and i am doubtful that it can actually penetrate our skin barrier. However,Ujene seems to be very different because Oviluxe, from what i found, is apparently a type of collagen that is biocompatible and of 99% pureness. Besides, I read Hyaluronic Acid, Vitamin C, Ginseng and Aloe Vera are added! That’s A LOT of goodness in a bottle eh? Also, i am very pleased to know that Ujene does not use harmful chemicals in their products.. It is common nowadays to see products being labeled as ‘parabens free’ but not sometimes they contain other harmful elements! Now read the list from Ujene! Lovingly free of phthalates, parabens, formaldehydes, propylene glycol, PEGs, volatile alcohols, mineral oil, petrolatum, paraffin wax, synthetic dyes, synthetic fragrance, and essential oils! A GOSPEL FOR SENSITIVE SKIN GIRLS LIKE ME! Would LOVE TO TRY THIS RANGE OUT! the most interesting i found out was that it’s a product from switzerland yet it contains chinese botanical extracts like ginseng! i use ginseng facial wash and it was indeed difficult to find. 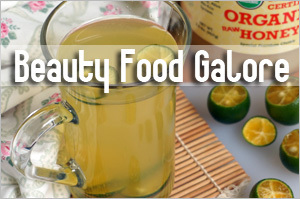 collagen and ginseng is certainly a plus! Honestly, I have not use this brand before but the results looks promising. 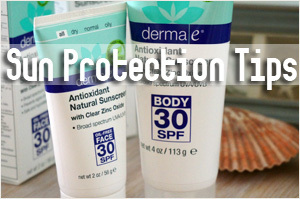 I have been looking for eye gel that can reduce puffiness and dark eye circles. Ujene’s range of eye gel is coupled with several ingredients that prevent against problematic eye bags and puffiness. 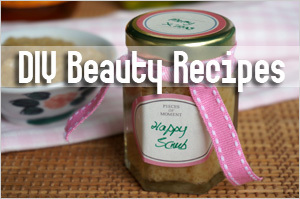 Its range of products also consists of many useful ingredients to help us retain/restore collagen. I just realised that Ujene products contains Meadowfoam Seed Oil that has Ultra-violet protection properties & provides good emolliency without being overly greasy . This is very interesting. 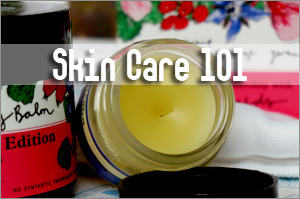 Most products that are moisturising tends to leave a gunky feel on your skin and would probably breaks you out too. What I found interesting are the fact that the collagen from the range is extracted from sheepskin and it is able to boost Collagen III production by up to 300% in 7 days. I love the fact that the products are not tested on animals. It’s interesting to find oriental expensive herb in the products, eg. ginseng and on top of that, the products do not contain unnecessary chemicals. I love the fact that the products are not tested on animals. 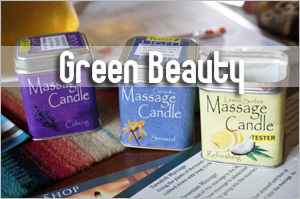 Itâ€™s interesting to find oriental expensive herb in the products, eg. ginseng and on top of that, the products do not contain unnecessary chemicals. I like products without animal testing, no petrolatum and no paraffin wax. All au naturale.. for ladies over 30 years of age, it’s importatn to return to big Earth and care our face with natural ingredients! Hope to have this gift to try out 🙂 Thanks! The Ujene serum contains no alcohol, which is great! Lai Ying Ying last post is: Hmm what is this that I am feeling? Thanks for this giveaway! I really like how the Ujene Puriste Collagen range uses 99% purity collagen (very high standards) and is free of chemicals that are harmful for my skin! Who says that you have to make sacrifices to look good? I find it interesting that UjÃ¨ne meticulously handpicks its ingredients with strict control over provenance and can trace these ingredients back to its source and origin. 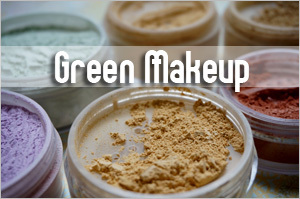 In the age of mass production of beauty products, the fact that they are able to keep up such high standards in terms of ingredients is simply amazing. For once, people would actually know what they are putting on their skin and rest assured that it’s only the best and finest ingredients 🙂 I’m soooo intrigued now! Would love to try this for myself and see the visible difference that all-natural, high quality ingredients can do for my skin! 😀 Hope I win! It’s really interesting to note that UjÃ¨ne does not wish to compromise its customers’ welfare with the use of chemicals and other harmful additives but instead chooses to create products that enhance the skin’s natural properties by biocompatibility formulations. 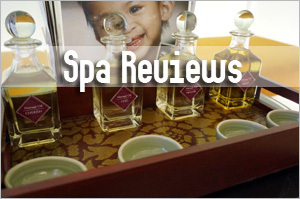 The fact that the range is hypoallergenic also gives people like me with sensitive skin more options in skincare. Lastly, that UjÃ¨ne is committed to using the ‘purest, finest ingredients’ and espouses values like anti-animal testing really puts it above other skincare brands and is definitely a keeper for environmentally and socially-conscious consumers like myself! I have liked the FB page of UjÃ¨ne as Naomi Lizaso 🙂 Thank you for the lovely giveaway! as a muslim,for me since the collagen is derived from sheepskin, it is certified halal, tested and certified Transmissible Spongiform Encephalopathy (TSE) free, Bovine Spongioform Encephalopathy (BSE) and Scrapie free.yay!! i found ujene interesting because it contains 99% purity collagen. i have never heard of any brands that contain such a high percentage of collagen before i read this article. I really like that Ujene doesn’t test on animals! The fact that it has such a high purity of collagen shows how much Ujene values the quality of its products. Glad to hear it also doesn’t contain harmful chemicals and focuses on using high quality ingredients so that our skin can get the best, natural benefits. I am not sure how collagen can be absorbed through the skin as some scientists and a skin pharmacist I personally know argue that collagen molecules are too large to penetrate through the skin. I therefore found it interesting that Sesame gave a good review of your product range, and I do wonder if it’s the other ingredients at work. It would be great to try a product range boosting such capabilities and share it with the women in my life – mommy, sisters, and girlfriends- if it works ! I love it that Ujene skincare range is natural and fuss-free – only four products in the range! I’ve always believed that less is more – basic skincare and sunscreen staples are all a woman needs for good skin. 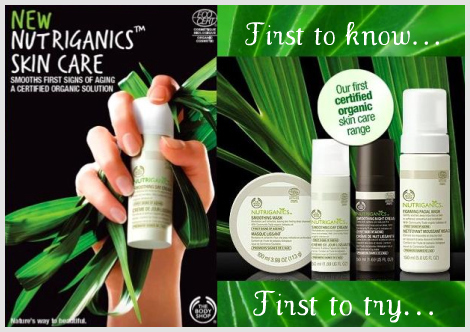 It’s great that the products are free from many harmful ingredients including phthalates, parabens, formaldehydes, propylene glycol, PEGs, volatile alcohols, mineral oil, petrolatum, paraffin wax, synthetic dyes, synthetic fragrance and essential oils (which overlaps with majority of the dirty dozen). Also, the products are infused with extremely high quality ingredients beneficial for skin, such as Oviluxe 99% purity triple-helix collagen, hyaluronic acid, Vitamin C and aloe vera. Looking at the ingredient list, I can barely hold my anticipation in trying out Ujene Puriste Collagen range! 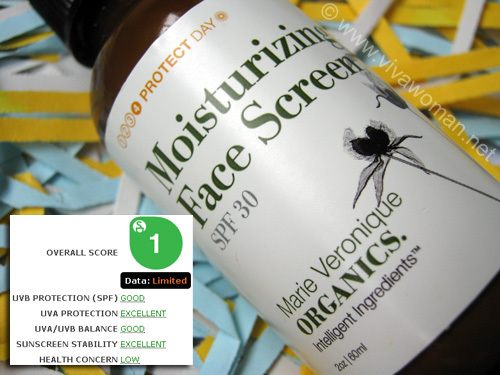 I’m always on the lookout for good chemical skin care even though currently I’m already using MVO. I’ve read that skin will somehow adapt to what we put on the, thus it’s better to use a few varieties. After all, just because 1 worked well for me doesn’t mean other won’t work wonders right? I would love to try this set as it also doesn’t contain phthalates, parabens, formaldehydes, propylene glycol, PEGs, volatile alcohols, mineral oil, petrolatum, paraffin wax, synthetic dyes, synthetic fragrance, and essential oils. 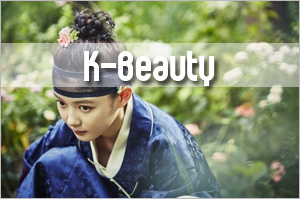 And the best part is that it has Oviluxe, which is 99% purity collagen, including ginseng and aloe vera. At this mature age, I would need all the collagen I can get to pump up my tiny tracks that have begun to form. What caught my attention to ujenes’ products were the fact that they contain OVILUXETM, which according to their website; is the finest grade, au-naturel and biocompatible, cell adhesive, 99% purity triple-helix collagen that acts as a moisture-magnet in skin, drawing and plumping up vital moisture within skinâ€™s epidermis. This is something you do not see in common collagen products and the addition of hyaluronic acid and vitamin c would enhance the overall skin repair and sustain the skins epidermic layer. I also love the fact that their range is natural and refrains from animal testing. I find it interesting that the Ujene serum contains Ginseng, as Ujene is a Swiss brand, formulated and made in Switzerland, and I see ginseng more commonly used in haircare products & for consumption. I like the knowledge that “every ingredient is meticulously handpicked with strict control over provenance and can be traced back to its source and origin”. Moreover, it’s wonderful that the Ujene range is hypoallergenic, & that Ujene believes in the philosophy of not using common harmful chemicals and additives, is against cruelty and animal testing.